This week we released the High Point Short on Gannett Peak (13,804′) – the most spectacular of the continental US state high points. This will be followed by a full-sized Skiing States Wyoming episode later this season. The HPS Gannett Peak video (5 minutes) is embedded below. The High Point Short series from Skiing States is just footage with music and is shorter than the full Skiing States documentaries. The film this week is a collection of clips from 6 different cameras of mainly the downhill action. The full story of the trek to Gannett will be covered with another video. 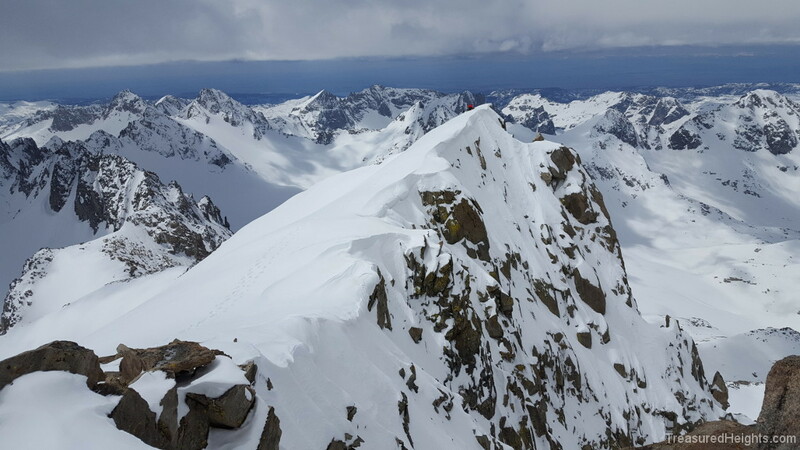 The video starts with reaching the summit and skiing the ridge which features a 2000′ drop off on the West and a slope over a 400′ cliff on the East. Snow was firm and funky with a crust so the skiing was done cautiously. Having just booted up this I knew there was a crust and was concerned it was strong enough to pop off a ski if we dug in. Ski from the summit south along this ridge. There is a 400′ cliff below the snow slope on the left, the right is a ~2000 face down to the Minor Glacier. Next, skiing is done down the falline of the south ridge on similar firm snow with cliff below. 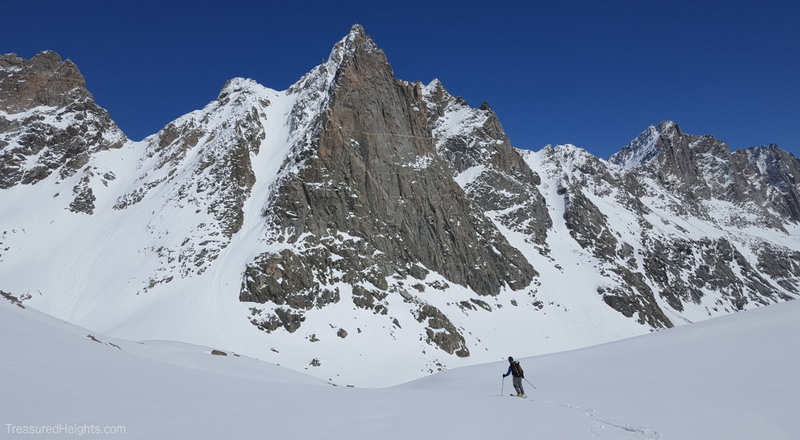 We cut right to connect with a couloir that is longer than the one featured in Jeremy Jones’s Gannett splitboarding video. The corner route from that video is a continuation of the falline off the summit ridge, but puts you out more to the North on Gooseneck Glacier. In our line we got steeper and longer skiing on a route often used by summer booters. It dumps you out on the glacier below Glacier Pass. From here we enjoyed better snow and smooth turns down to the valley below. Then we skinned back up to Bonnie Pass and skied down some wet sloppy snow. By skiing here in May we were not forced to walk down a typically thin snow area (its south-facing). Next the video cuts to Jeff skinning up another peak. This was done on a different day and it shows us cutting through corn on south-faced moderate slopes. That skiing had better quality snow than the Gannett day. There are a lot of good lines around there, and Mt. Helen is the most well-known because it is very aesthetic. Helen was on our list but it was totally trashed by avalanche chunder and threat of warming rock walls releasing snow loads above the route. Three years ago I did Keplingers Couloir on Longs Peak under similar conditions and the chunder definitely was not fun or worth doing again. Instead we did a new thing and got great turns and views. For an article on what it takes to do a Wind River trip I have another article here.